In March 2010, my husband, Leroy attended a gun show at the local Armory. After several hours at the show he came home very exuberant to show me his latest purchase. Walking down the alley, I couldn't imagine what his purchase was. Stopping at a snow drift he lifted up a tarp and WOW.. to my surprise a 1979 Triumph Spitfire that he bought from our neighbor. Our neighbor decided to sell the car because the muffler broke off during one of our road construction seasons. His wife stated it was too noisy to ride in and with a heavy heart he decided not to fix it; so in the back yard under a tarp it went for 10-12 years. The Spitfire couldn’t be moved until the spring because that winter we has many many inches of snow and the car was completed buried (see pictures). The Spitfire had initially been driving to MN from California by a student who attended Mankato State University. 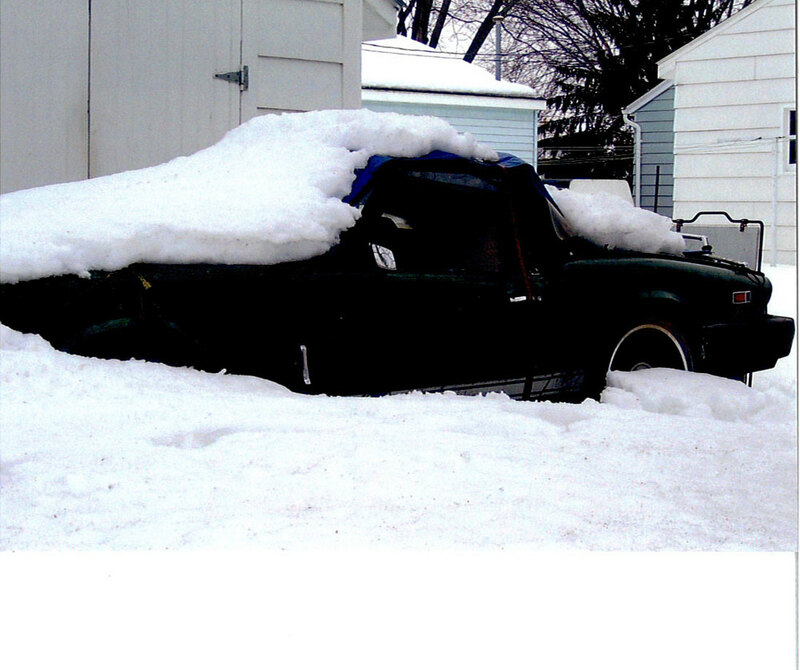 During one blizzardy winter, the car was left in a snowplow zone and towed to an impound lot and was never claimed. A custodian bought the car, fixed it up and proudly drove it for several years until the muffler incident. At present the Spitfire is in our garage anxiously waiting for LeRoy to add more new parts and get it up and running to display at the local car show. Our first restoration project has been free-up the motor and my wife is working on refinishing the wood dash. However, to our dismay the Spitfire will have to wait a little longer for the open road.